It is critically important that impact is being demonstrated in school-wide measures. The new Texas state accountability system contains an “Index 3” distinction available for campuses that demonstrate that they are closing performance gaps across different demographic groups. 25% of middle schools across the entire region received this distinction in 2014, and 25% of middle schools in our RAISEup Texas target districts achieved the distinction. 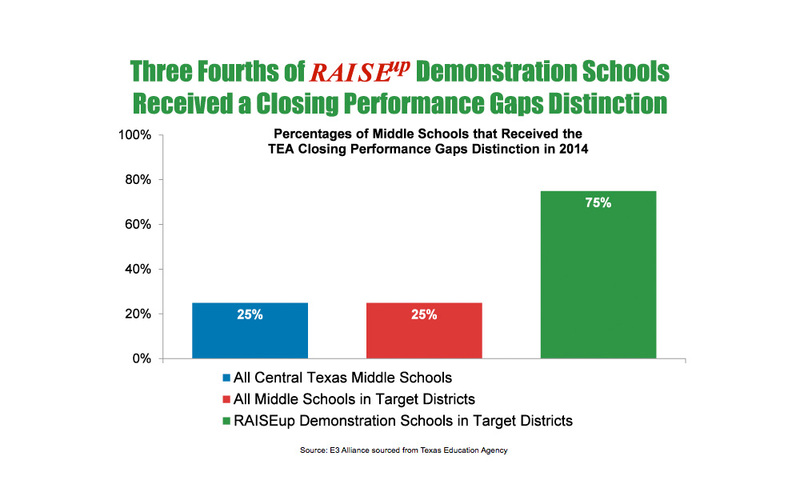 Yet 75%, 3 times the rate, of RAISEup Texas demonstration schools in those same target districts received the Closing the Performance Gaps distinction!